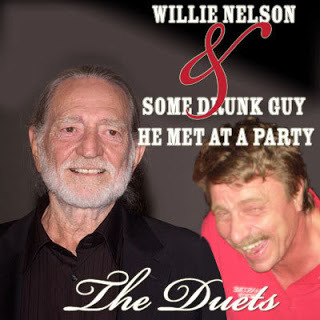 Willie Nelson has announced that his next studio album will be a collection of duets with you. He plans to show up at your house around 6ish this evening to begin work on the project. Singing lessons will be unnecessary as Nelson believes you have an "earthy everyman/woman vibe" that will translate well to his 376th official release. The songs will include several traditional standards such as "Wayfaring Stranger," a couple tracks by top Nashville songwriters, and a few as-yet-nonexistent cowrites with you. When asked what the album might sound like, Nelson mentioned "an organic and freewheeling set of unpolished but exciting country songs." You will go on a short full-band tour with the country legend, including stop-offs in Austin and L.A., as well as an acoustic radio tour for release week. There will also be a taped GAC special called "Willie and (your nickname)." You will join a celebrated throng of artists who have shared recorded media with the well-loved Texan troubadour, including Merle Haggard, Snoop Dogg, Johnny Cash, Julio Iglesias, Ray Charles, Lucinda Williams, that guy from Matchbox 20, Sheryl Crow, Wynton Marsalis, Toby Keith, Ray Price, Waylon Jennings, George Jones, Dave Matthews, your aunt Ruthie, Ryan Adams, Neil Young, Emmylou Harris, his second bus driver, Mel Tillis, Lacy J. Dalton, Carlos Santana, Asleep at the Wheel, Leon Russell, Dyan Cannon, Elvis, Kenny Chesney, Lee Ann Womack, Kris Kristofferson, Pat Green, B.B. King, Patsy Cline, Kid Rock, Brian McKnight, Bonnie Raitt, ZZ Top, Eric Clapton, his supplier, Norah Jones, Paul Simon, Shania Twain, Wyclef Jean, Diana Krall, Lyle Lovett, Shelby Lynne, some drunk guy he met at a party, John Mellencamp, Steven Tyler and a few hundred others. After a quick final "session" on his bus, you will resume your normal life, while Willie will return to the studio to begin work on his follow-up album, a collaboration with T-Pain titled Willie n' Pain due out later this year.